A leader in global information and analysis was looking for an effective tool to centralize the information and to automate the process. The Company was looking to maintain Supply Management, Procurement and Vendor Intake processes. 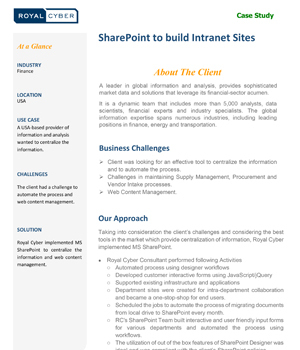 Using SharePoint 2013, we helped the client to create an appealing Global Intranet that was easy to manage, monitor and maintain by Information workers and content authors.